How a timely twist saved some start-ups from sinking into oblivion. A few months after US software giant Microsoft paid $8.5 billion to acquire Internet phone company Skype in May 2011, serial entrepreneur Saurabh Aggarwal gave up his ambition of growing a similar application called OctroTalk that allowed users to make calls online. The Stanford University graduate had bootstrapped his Noida-based company, Octro, in 2006 and was trying to make money by charging a small fee to use the platform on Symbian phones. But it succumbed to competition when companies such as Skype and Nimbuzz raised a huge amount of venture capital (VC) and started offering the service for free. "In 2012, we decided we had lost the battle in the communications business to guerillas like Skype and called it a day," says Aggarwal, who in 2005 had sold his text-based communication services provider VeriChat to US-based Intellisync. I think I was with the right thing [classifieds] at the right time when I look at how those like Quikr have grown. Aggarwal may have given up on one ambition but he soon found another. He started making mobile games - the most monetised mobile apps across the world. Octro makes India-themed, multi-player games such as card game Teen Patti and makes money by selling digital goods within the apps. With more than 10 million downloads, Teen Patti is one of the highest revenue generating Android apps in India. That helped Octro attract $15 million in funding from VC firm Sequoia Capital in June. Aggarwal now aspires to stand next to global gaming leaders Zynga, the maker of FarmVille, and King Digital Entertainment, which made Candy Crush. Octro's journey from a provider of Internet calling services to a game developer is not unusual. Entrepreneurs now need to quickly respond to market dynamics more than ever before due to the rapid pace of change and because technologies get obsolete faster than data that establishes the change reaches the CEO's table. Globally, many start-ups have either tweaked their business models or even changed their main business to survive - and succeed - after initially failing to make a mark. For instance, daily deals website Groupon was born out of its founder Andrew Mason's previous venture The Point, a social media platform. Similarly, the founders of the global payments company PayPal earlier set up Confinity, which created a cryptography and payments product called Fieldlink that was later abandoned to develop PayPal. In India, too, several ventures have adopted the same strategy to stay afloat. Snapdeal, for instance, was a daily deals website in its first avatar but is now an online marketplace valued close to $1 billion competing with the likes of Flipkart and the India arm of Amazon. Many lesser-known start-ups are now joining the list. Entrepreneurs say tweaking the business model or a complete U-turn is not so costly or difficult for start-ups as it may be for larger companies. "If the business model is not working, banging your head against the wall is not the right thing to do," says Samir Kumar, Managing Director at early-stage venture firm Inventus Capital. "The best entrepreneurs sniff opportunity and change." One of the start-ups Inventus has supported is TELiBrahma. The Bangalore-based company started in 2004 providing value-added services to European telecom operators. Four years later it sold the business and began offering Bluetooth services to retailers to push deals and offers to customers walking into their stores. Why Bluetooth? "Data connectivity on phones was a big challenge those days," says Narsimha Suresh, Founder and CEO. Soon the company had 20 large retailers using its services at 2,000 outlets. But the upswing didn't last long, as growing popularity of Internet-enabled smartphones took the sheen off Bluetooth services. The company then launched a product called Buzz that combined Wi-Fi connectivity and a new version of Bluetooth. It has also launched a contextual computing product that lets media companies and advertisers better engage with customers. Often, entrepreneurs move on to a new business while trying to make their initial idea work. Take Shivakumar Ganesan, for instance. Ganesan, a techie who previously worked with Yahoo! and Flipkart, set up a classifieds business in Bangalore called Roopit. The venture needed a call centre to grow operations but Ganesan did not want to hire too many people or set up a huge infrastructure. He tried solving the problem by developing software to get one number working on multiple phones with a central system diverting calls to these phones. This helped Roopit handle customer calls and also made some of his entrepreneur friends interested in buying it. The early traction the product got with about 20 paying start-ups made him close the shutters on Roopit and go full throttle on the automated call centre. 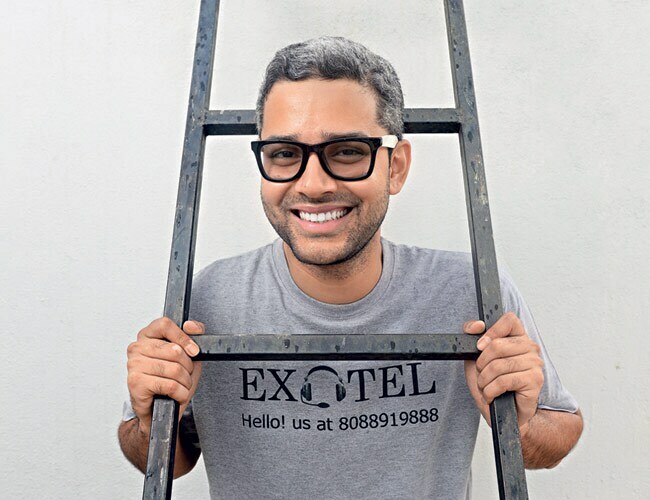 The product has now evolved into a cloud telephony service called Exotel. Ganesan has scaled up the venture from Rs 12 lakh in revenue 2011/12 to Rs 4 crore in 2013/14. He does feel a sense of regret sometimes, though. "I think I was with the right thing [classifieds] at the right time when I look at how those like Quikr have grown. But that's okay, I had to chose between two babies," he says. Many a time the lack of a clear revenue model prompts start-ups to change. This happened in the case of Reviews42 and Frrole. Reviews42 moved on from a product-reviews portal to a business-to-business (B2B) company selling software to small merchants. Frrole, spun off by founder Amarpreet Kalkat from Internet products company Ciafo Techware, started as a consumer news website but now helps media companies plug relevant tweets into TV programmes and news websites. "B2B solutions have much better monetization capabilities than B2C [business-to-consumer]," says Kalkat. Competition can also force start-ups to explore newer markets or launch newer products. Chennai-based OrangeScape Technologies started in 2004 offering client-server architecture technology to large companies that could use it to build multiple business applications. However, competition from tech giants such as IBM got OrangeScape to venture out into the Indian market offering Platform as a Service (PaaS), a cloud-computing technology. "We were one of the first companies in India to offer PaaS, so we had the first-mover advantage," says Founder and CEO Suresh Sambandam. It got about 50 large companies as clients but longer sales cycles led it to divert attention towards small and mid-size companies. 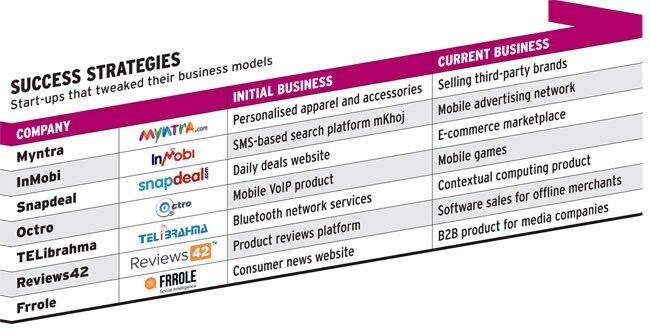 Policy changes can also compel start-ups to tweak their business models. One such case is PolicyBazaar. The company started as an insurance policy comparison site in 2008 and grew to Rs 20 crore in annual revenue by 2011. It earned revenue by passing leads to insurance companies, but had to change after the Insurance Regulatory and Development Authority in 2011 capped the fee through leads at Rs 10, a tenth of what the company was earning until then. "I haven't slept for 20 per cent of the nights since then. My hairline is receding," says Co-founder and CEO Yashish Dahiya. The company cut back on marketing and technology spends and hired about 800 people in the call centre team. "From a technology company we became a sales organisation, which is what I had never dreamt off," says Dahiya. Subsequently, PolicyBazaar was recast and now also sells insurance products. That has helped revenue jump six-fold in three years to Rs 60 crore in 2013/14. How do start-ups know it is time to change? "The obvious thing to do is to look at data that helps convince people [to change]," says Beerud Sheth, Co-founder and CEO of Webaroo, which transformed from a free group messaging application for consumers in 2007 to an enterprise communication tool. "But by the time the data comes, it is actually very late." Course corrections are not just difficult from an operational point of view. These are great leadership and human resource challenges as well. Kiran Gopinath, Founder and CEO of Ozone Media, had to let go a huge sales team to bring in more engineers and product managers when the company changed from an advertising network to an ad technology firm. It now offers services such as programmatic media buying, which involves buying and selling ad inventory from aggregators on ad exchanges rather than from a fixed set of advertisers and publishers. "It has been extremely difficult to get people to turn around when you are making a huge change," says Gopinath. "A majority of them will be in a state of disbelief for a long time and will tend to slow you down. Sometimes, the best idea is to let them go, get fresh people and build the company again." Not all entrepreneurs, however, can or would like to let their teams go and build their companies all over again. To change and survive or to remain emotional about the initial product or business model and sink like the captain of a sinking ship is, after all, the entrepreneur's choice. Suresh of TELiBrahma articulates this best. "In India, as long as the entrepreneur is willing to survive, the company won't go down," he says.